There really isn’t any option, is there? Sure, Gant was an interesting guy that had his reputation made before St. Louis. Horner was the big free agent signing after Jack Clark left and never lived up to the money. Keane managed the amazing ’64 Comeback Cards, then split for New York right afterwards. All interesting stories, for sure. However, Pujols dominates the landscape when it comes to this number. We saw a legend in the making, something that just doesn’t happen every day. In fact, Cardinal fans have been lucky to have such a consistent, amazing player come around twice in their franchise’s history. Our parents (if you are of my generation) saw Stan Musial be that man basically from day one. Pujols was that way for us. He burst onto the scene in a way I don’t think could happen today, with our focus on the minors and such. People knew his name, sure, but nobody knew what to expect. 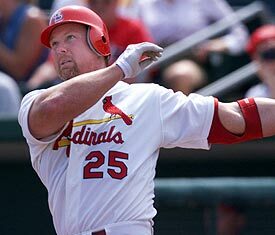 Even his start in the majors is shrouded in legend, what with Mark McGwire telling Tony La Russa that Pujols needed to be on the team and Bobby Bonilla coming down with a hamstring injury to seemingly free a spot for him. All he did from then on was hit and hit and hit, coming up with dramatic moments and big blows. It was an amazing decade-plus of seeing the best player in baseball in Cardinal red. The magical, Disney-like run didn’t last, of course. Free agency kept Pujols from being a lifetime Cardinal when the Angels came along with a better offer. While it’s worked out for both parties, there’s still something wistful about not seeing him finish up under the Arch. We likely won’t see 5 worn again. Which is a great reason to use it today, just a few days from Opening Day!